Label Size: 4-1/4" x 14"
With these Very Large Carton Labels you Wrap the labels around the corner of the Box to label on two sides. 100 Sheets, 200 Carton "Wrap a Round" Labels, 13" x 4-1/4". Perforated for easy and precise wrapping around two sides of a carton. 6-1/2" x 4-1/4" shows on each carton side. 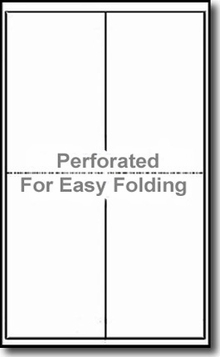 This is a great way to label cases or cartons that may be stacked on pallets--the label can show on 2 sides. Sheet is Legal Size - 8.5 x 14 or 8-1/2 x 14.